It was a win. It was a 50-point win. It was a "cover the largest spread in Michigan football history" win. It was an offensive onslaught that was both expected and deserved. Michigan needed a game like this. I think every team needs a game like this. You just sort of forget about what happened two weeks ago, and just stare at the scoreboard and nod. Denard's pick-6 made everyone a little uncomfortable, but his beautiful touchdown run made up for that, I think. Michael Cox playing his best game in Michigan stadium did also. But when it's all said and done, its best not to look too far into what you saw on the field Saturday. Resist the urge to draw too many conclusions about Michigan's strengths and weaknesses. UMass is not a good gauge. Especially when you're only seeing about half of the offensive and defensive playbooks. On a day when a little blond-haired kid from Oklahoma can get a bigger ovation from 110,000+ people than the, now legendary, Ron Kramer...you know that you just want this day to come and go with no surprises. Just get the win, don't look bad, score big points, and move on. My biggest concern: Beyond Denard’s inconsistency tossing the ball, Fitz couldn’t seem to get many yards with the play that was called—he had to bounce it outside often to create space. That’s not This-is-Michigan-Fergodsakes football, fergodsakes. The D-line is still a big question mark. UMass got paid. Michigan got a chance to breathe easy and give their backups plenty of run. Now the team can look ahead to Saturday night's matchup with Notre Dame; for today, they can feel content about handling business as expected. With the baby seal emphatically clubbed, it's time to move on to the real season, not unscathed but with the ultimate goal—a Big Ten championship—still within reach. Overall, to say you can take a lot away from this game would be a stretch, but I do believe the playing time for the freshmen (snaps on O for Norfleet??? Awesome), and the extra game time to adjust our running game should prove to be priceless. Play of the game . . . Devin Gardner's catch-and-run. Gardner did a great job of catching the ball, getting upfield, and stretching for the pylon. He's deceptively strong for having a lanky frame and did a great job of staying inbounds when it looked like he would get knocked out at around the 2-yard line. 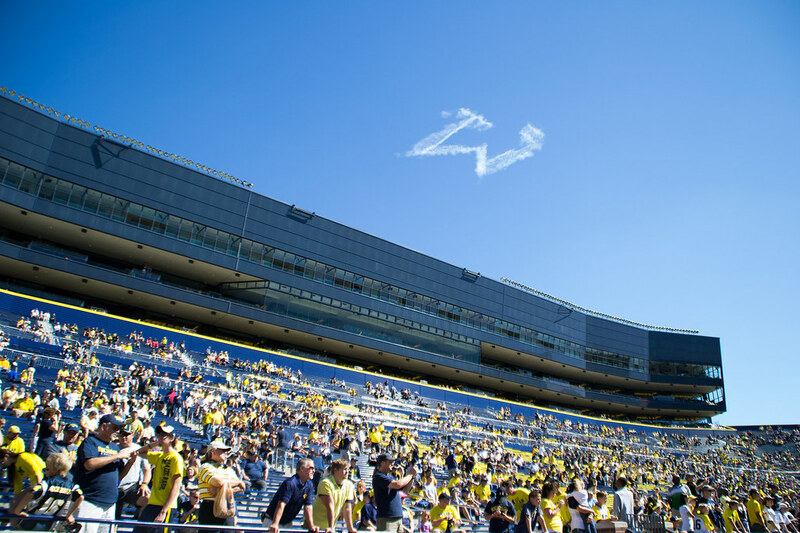 Photo gallery from MGoBlog, MVictors' Dr. Sap decals, game highlights, entire game video via MGoVideo, post-game pressers.